We like the crisp crunch of cauliflower. Add celery and peas and ranch dressing, a bit of tangy onion and crispy bacon, a handful of chopped cashews — a quick and easy, delicious and colorful Crunchy Pea Salad. You can thaw the peas in the fridge ahead of time. Or not. (I usually don’t.) Break or cut the cauliflower into bite size pieces. I like the looks of the little florets in the salad, but sometimes a knife is needed to keep the pieces small enough to eat easily. Crisp the bacon yourself and crumble. Or use about 3 tablespoons of genuine crumbled bacon off the shelf to save time. Add cashews, just slightly chopped for a bit of texture and taste to “fancy” it up, if desired. I don’t usually keep cashews on hand because they disappear long before they can go into a recipe. (oh, that tiny bit of salt on my hand — yep, it’s me!) Mix everything together ahead of time, at least an hour, so the flavors have time to properly meld. (But I have put it on the table shortly after mixing and it disappeared quickly!) Leftovers will keep for a day in the refrigerator. However, the only times we’ve done that is when I’ve sneaked out a portion before serving to pack for work lunch. Straightforward and simple to make. Enjoy!! 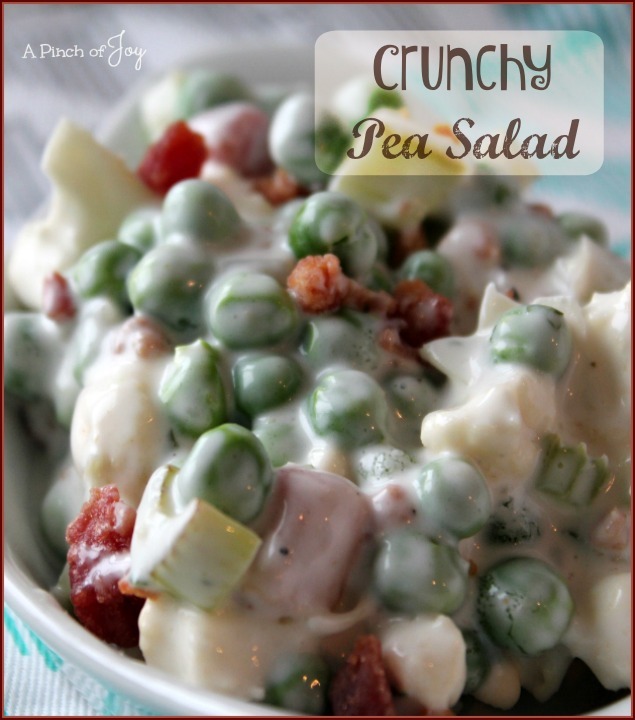 Crunchy peas,celery and cauliflower with creamy ranch dressing accented with a bit of onion and bacon make a great and healthy vegetable salad! Brown bacon if using, cool and crumble. Mix peas, celery, cauliflower and onion in medium bowl. Stir ranch dressing and sour cream together in small bowl and pour over vegetables. Add cashews and/or bacon, if using. Stir everything together. Chill one to two hours before serving. I’m so glad you stopped by today! Be sure to follow A Pinch of Joy so you don’t miss a thing! I’d love to have your company on this venture!! Follow: Facebook / RSS feed / bloglovin’ / twitter and pinterest. Share: please click one of the buttons below! Your support of A Pinch of Joy is appreciated! Stopping in from the Wednesday Roundup. I love this salad, I’ve been making a version of this for many years and it’s always a summer staple for us. I was happy to see it in the list. Your recipes all looks so good!! Thank you! Clicked on your name and visited the Lazy Gastronome – I can say the same thing. The Breakfast Pizza sounds great and I will be back to check out the rest in the series! Sounds so good…I make a Pea Salad that we all love, too…canned English peas, tiny cheddar cheese cubes, chopped celery, red skin peanuts and mayo. I love that salad too! The peanuts are a new idea to me — will have to try that! Thank you for sharing your yummy salad on he #OMHGFF it looks delicious! Thanks for the pin and tweet! Appreciated! Thanks for the pin! Coming over to check out rainbow desserts . . . I am looking for a great and quick to make recipes to have ready for my lunch when I am working. This looks great! This is really easy to make . . .hope you enjoy lunch!